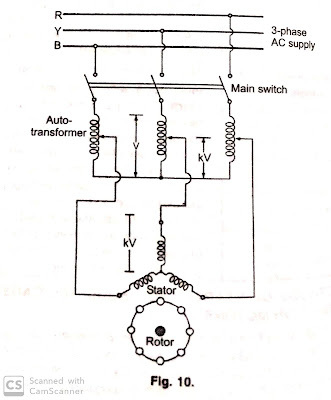 Method Of Starting Of Squirrel Cage Induction Motor— In case of an induction motor, at the start when the rotor is at standstill the squirrel cage rotor is just like a short-circuited secondary. Therefore the current in the rotor circuit will be very high and consistently the stator also will draw a high current from the supply lines if full line voltage where are applied at the start. The generated voltage in the rotor circuit, Of course, decreases with the increase in speed of the rotor, So that both the rotor and stator current drop to values determined only by the mechanical load. 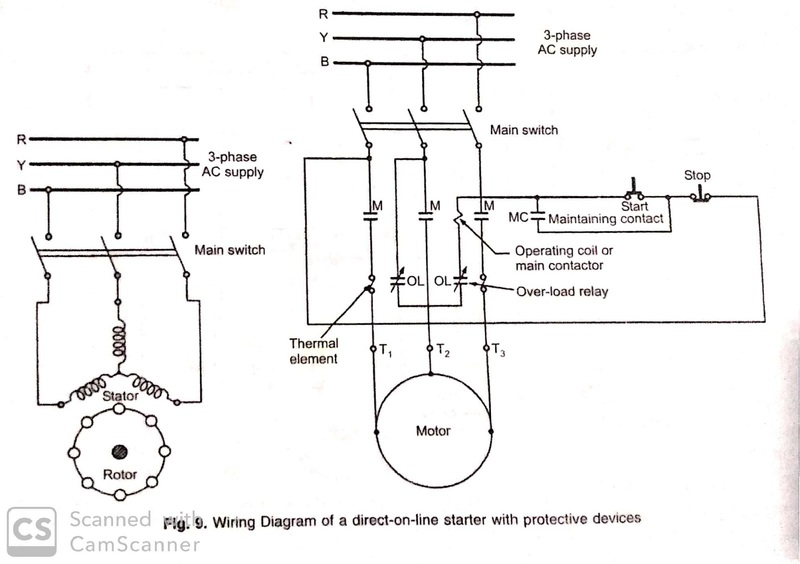 It is important that the starting current to be minimized to such an extent that the line voltage drop does not affect the operation of other equipment connected to the same distribution network. Modern well-designed induction motors will usually draw 5 to 7 times The rated full load current at the starting instant if rated voltage is applied to it. 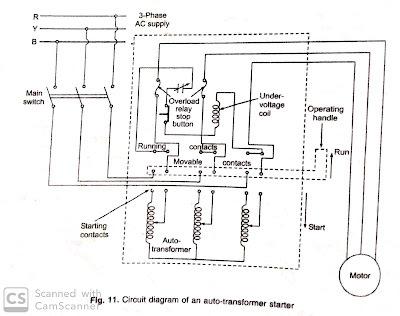 To reduce the starting current, It is to impress the lower voltage across stator winding at starting instant. But it results in a reduction of starting torque because starting torque is proportional to the square of impressed voltage, Which is serious objection whether or not such a great reduction in starting torque is permissible will depend, Of course, Upon the application. There are several methods of starting a squirrel cage induction motor the most common method are described below. Squirrel cage induction motor up to 5 kilowatts (kW) are started by this method. 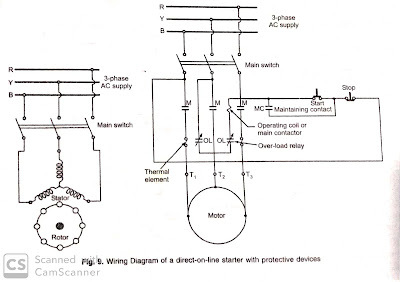 This method involves direct switching of polyphase squirrel cage induction motor supply mains and the push button type direct on line starter, Which is very common in use, are also shown in the figure. It is simple, and inexpensive, easy to install and maintain. It consists of a conductor i.e., An electromagnet, with its associated contacts, Usually overload under voltage protection devices and a set of a "start and stops" push buttons. The start button is momentary contact, That is held normally open by a spring. The stop button is held normally closed by a spring. for motor overload protection, Thermal overload relays are commonly used. Under voltage, protection is provided by the contractor (which is controlled by three wire control circuit) maintenance the interruption of the circuit even after the supply is restored. 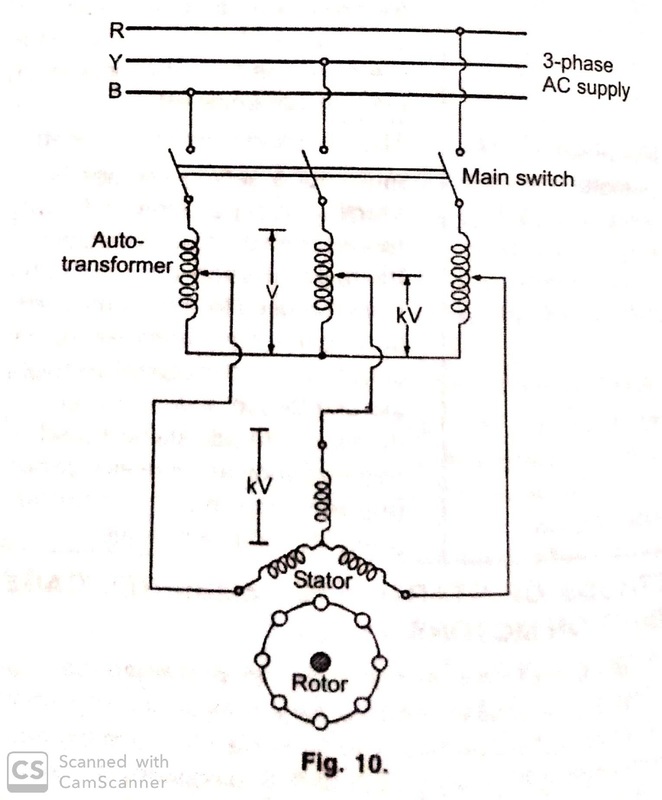 In the auto transformer starting method, The reduced voltage is obtained by talking tappings at suitable points from a 3-phase auto transformer as shown in the figure. The autotransformers are generally tapped at 50% 60% and 80% tapping points, So that adjustment at these voltages may be made for proper starting torque requirements. Since the contacts frequently break large value of current, Arcing is sometimes quenched effectively by having them assemble to operate in an oil bath. 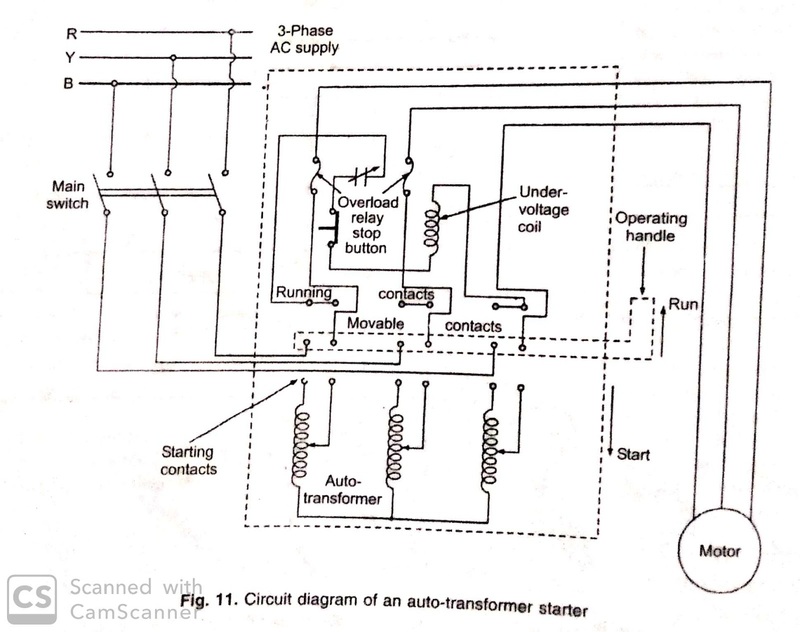 Auto transformer starter may be either manually or magnetically operated. The internal losses of the starter itself are small during long starting periods. The drawbacks of these starters are low power factor and high cost in case of lower output rating motors. For starting of large squirrel cage motors of output rating exceeding 20 kW, This method of starting is often used. This types of starter are suitable for the Star connected as well as Delta connected motors.